TURQUIE – Levent Valley - Home to humans in every age, cultural officials have determined that the Levent Valley in the eastern Anatolian province of Malatya possesses traces of life going back 10,000 years. Recent archaeological work in the Levent Valley in the eastern province of Malatya’s Akçadağ district has revealed traces of life from the Neolithic Age. Levent İskenderoğlu, chairman of Malatya’s branch of the Conservation Implementation and Control Branch (KUDEB), said the 28-kilometer-long Levent Valley was a very attractive place thanks to its geological formations. The valley is home to thousands of large and small caves carved by the human hand, he said. “One can see the traces of life in these caves with the naked eye.” KUDEB has recently completed inventory work in the valley, he said. “The work, carried out by scientists – KUDEB’s technical staff including art historians and archaeologists – has revealed that life existed there until the Paleolithic age. We have seen traces of life from the Neolithic period in the valley caves. There are also traces of the Hittite, Roman, Seljuk and Ottoman periods. Life is still continuing in villages. We can say that life has been continuing in the Levent Valley, which is a natural wonder, for 10,000 years. People have chosen this area to life in every age.” Iskenderoğlu said that within the scope of the work, they had discovered the existence of 26 areas that have geological importance, adding that there were nearly 20 villages in the valley including Levent, Kozalak, Bağ and Sarıhacı. The official also said they would publish the result of the work in a book. Kozalak village headman Hüseyin Ünal said the former name of their village was Hartut and added that living in the valley was fantastic. “The air is clean, the water is clear, the soil is fertile in this valley. It gives happiness to people living there.” Ünal said people in the region made a living by cultivating beans, sugar beet, apricots and chickpeas. He said the Çerkeztepe tumulus, which is located in the spot where the Bağ and Sakalıuzun villages merge in the valley, had been declared a protected site by the Culture and Tourism Ministry, adding that there were 5,000-year-old structures between Yalınkaya and Kozalak. 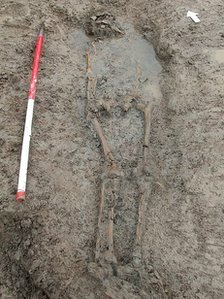 ROYAUME UNI – Banwell - A Roman cemetery containing several human burials has been found during work on a new water mains in Somerset. The finds were made by archaeologists during the laying of a four-mile (7km) long mains between Banwell and Hutton. Among the skeletons, which have been exhumed for further study, there was one in a partially-preserved coffin. The cemetery was discovered "isolated from the surrounding landscape" in a curved water-filled ditch. Roman cemeteries, according to Neil Shurety from Border Archaeology, are generally sited outside settlements and away from areas of human habitation. "In this case, the cemetery is evidently associated not with a town but with a villa site and it could thus represent a private burial ground serving a wealthy landowner and his immediate family," he said. The human remains were orientated north-south "with the head to the north, which suggests a pre-Christian burial practice," said Mr Shurety. "One of these individuals seems to lie within a partially-preserved wooden coffin - constructed from timber planking," he added. He said the site provided evidence of a "landscape almost continually in use for the last 5,000 years". "It covers a period ranging from an intriguing prehistoric timber structure to a Roman cemetery and defensive ditches through medieval land management features to today's agricultural activity," he said. The finds, which include an estimated 9,000 pieces of pottery, brooches, a coin of Constantine the Great and a pin of Roman date are due to go on display at Banwell Village Hall on 19 November. USA – Bishop - Ancient hunters and gatherers etched vivid petroglyphs on cliffs in the Eastern Sierra that withstood winds, flash floods and earthquakes for more than 3,500 years. Thieves needed only a few hours to cut them down and haul them away. 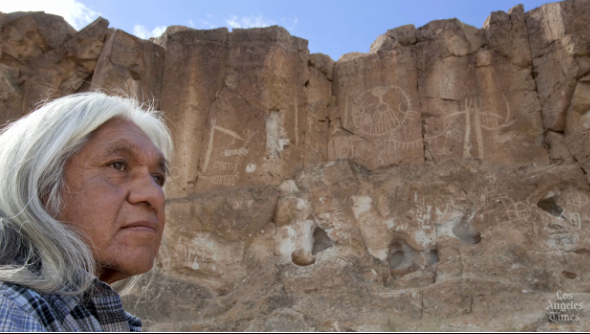 Federal authorities say at least four petroglyphs have been taken from the site. A fifth was defaced with deep saw cuts on three sides. A sixth had been removed and broken during the theft, then propped against a boulder near a visitor parking lot. Dozens of other petroglyphs were scarred by hammer strikes and saw cuts. For generations, Paiute-Shoshone tribal members and whites have lived side by side but not together in Bishop. But desecration of the site, which Native Americans still use in spiritual ceremonies, has forced reservation officials and U.S. authorities to come together and ask a tough question: Can further vandalism be prevented? "How do we manage fragile resources that have survived as much as 10,000 years but can be destroyed in an instant?" asked archaeologist David Whitley. For archaeologists, the images carved into a half-mile-long volcanic escarpment depict the culture and spiritual notions of the ancient tribes that once populated the sage flats and river valleys of the Eastern Sierra.